At Northtown Collision Center, we specialize in auto body repair. 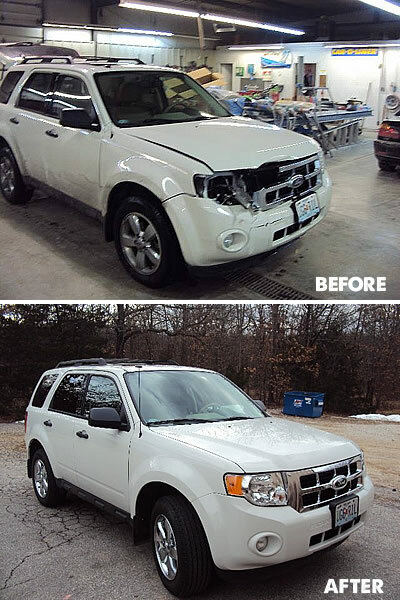 If your vehicle is involved an accident, our collision repair services will make your car look like new. Our collision repair services ensure full restoration of your vehicle to pre-accident condition. We are a full service auto body shop located in Camdenton, MO. Serving the entire Lake of the Ozarks area, we offer complete auto body repair services including towing, auto body repair, auto glass replacement, structural repair, and suspension replacement. When you are involved in an accident, the last thing you need is additional stress with your vehicle repair. We handle the job from start to finish, inlcuding dealing with your insurance company and coordinating a rental car (if you need one). At Nothtown Collision Center, we strive to achieve superior customer satisfaction with top notch customer service and quality repair results. Our goal is to make your car look like new again. 13 time winner of the Lake Sun “Readers Choice” award! From Camdenton Square: North on Business Hwy 5 for 2.2 miles, then left on Old Route 5 for 1.8 miles. From the Junction of NEW State Rt 5 & Hwy 54: Go North on Rt 5 to the Pier 31 Exit. Go over the overpass 4/10th of a mile (West) to the first turn on the right (Old Rt. 5). Go North on Old Rt. 5 for 1.8 miles. We are on your left. From Greenview/Niangua Bridge: A mile south of the bridge, turn right on Harvest Rd. The highway sign reads "Lake Rd 5-71 thru 5-81" as well as "Old RT 5". Turn right (west) to Old Route 5. Turn left on Old Route 5 and go 1.7 miles, we are on your right. Copyright 2014-2017. Northtown Collision Repair Center. All rights reserved.